Changing of the Watch. – Paper Never Refused Ink! Reproduced here with the kind permission of the Editor of An Cosantóir, this is my Article which featured in the March 2018 edition. In the days of sail, the ships bell would ring out the passing of time and signal to the crew that it was time for the change of the watch. 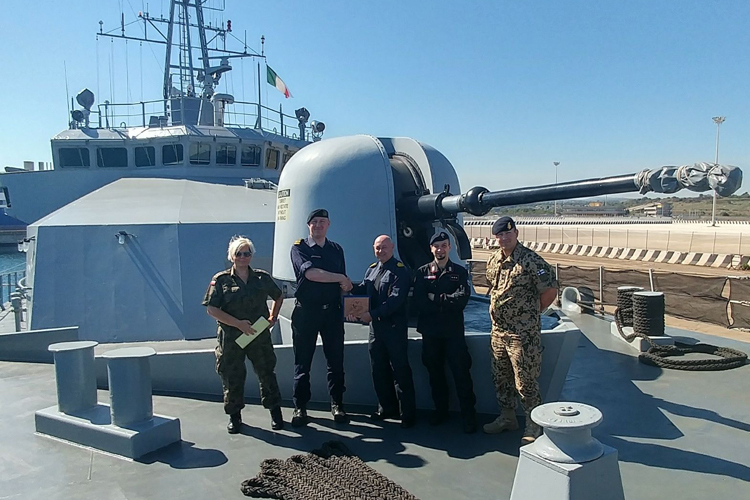 That bell has pealed on Haulbowline and Commodore Hugh Tully, Flag Officer Commanding the Naval Service (FOCNS) has handed over his watch to the newly promoted Commodore Michael Malone, with effect from the 26th of December last. 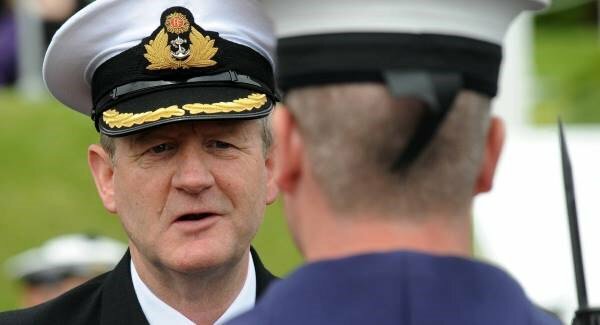 And what a watch it has been, Commodore Tully has given 42 years of exemplary service to the Irish nation. His career spanned some of the most challenging periods of the Navy. 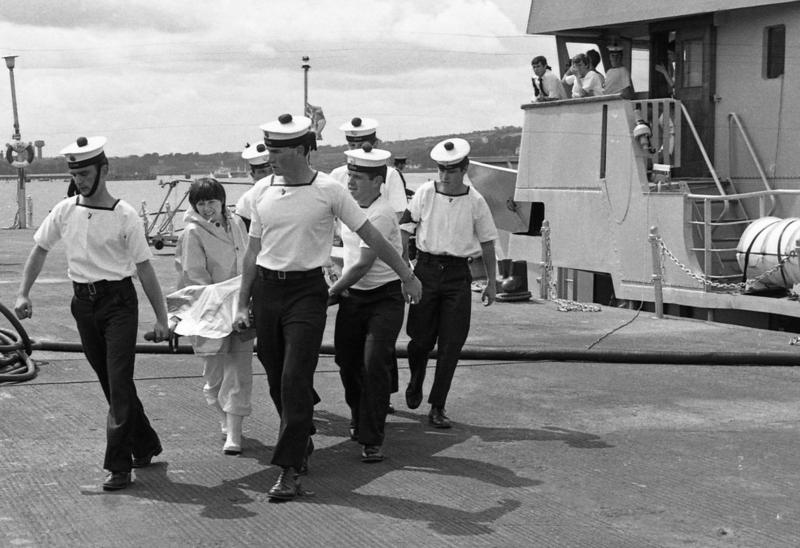 Joining the service in 1975 in a class of three cadets, these future Naval Officers were dispatched to Dartmouth in the United Kingdom (UK). They returned from the UK and were sent to sea on LÉ DEIRDRE, which at the time was the only Offshore Patrol Vessel (OPV) in service, commissioned in 1973, she joined the three venerable minesweepers GRÁINNE, FOLA, BANBA which comprised the entirety of Irelands Naval assets. When he qualified as a Naval watchkeeper, he joined LÉ FOLA as the Navigation and Gunnery officer combined. Rotating ashore he spent some time on Spike Island with the Cadet College, where he was, in fact, the cadet class officer for Commodore Malone. A sad day, long remembered, as the bodies are unloaded at Haulbowline. Air India Flight 182 was an Air India flight operating on the Montreal–London–Delhi route. On the 23rd of June 1985 the aeroplane operating on the route, a Boeing 747-237B, was blown up by a bomb at an altitude of 9,400m and crashed into the Atlantic Ocean while in Irish airspace. A total of 329 people were killed, including 280 Canadians, 27 British citizens and 22 Indians. The incident was the largest mass murder in modern Canadian history. A memorial that honours the memory of the victims of the 1985 Air India disaster can be found in Ahakista in County Cork. Each year ex-crew members of LÉ AISLING from that time assemble there to pay their respects and to renew their bonds of comradeship from when they were young and faced that terrible event together. In 1986, Commodore Tully went to serve with the United Nations Interim Force in Lebanon (UNIFIL) and in 1987 this native of Dublin was posted to Naval Headquarters in his hometown for two years. He then joined LÉ EITHNE as XO, before receiving his first command in 1990 onboard LÉ Aoife. in total, he spent almost four and a half years in command of LÉ AOIFE, with a shore posting in-between. He served as Commandant of the Naval College and then he completed his Command and Staff course. He manged to fit in service in Naval Intelligence and the Fisheries Monitoring Centre (FMC). His last sea-going command was in 2007 onboard LÉ EITHNE as a Commander. 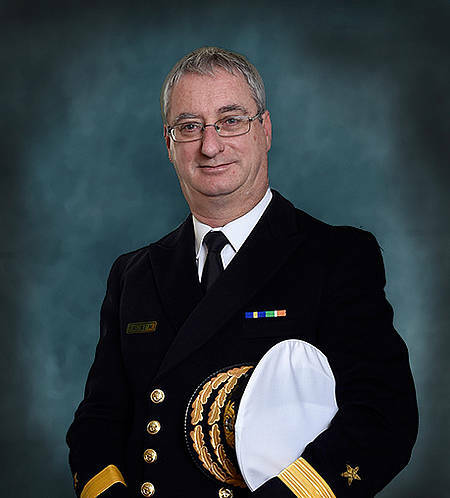 In 2013, he was promoted to Commodore and appointed FOCNS. The first of the new P60s arrived in 2014 and ‘Three of them arrived on my watch’. 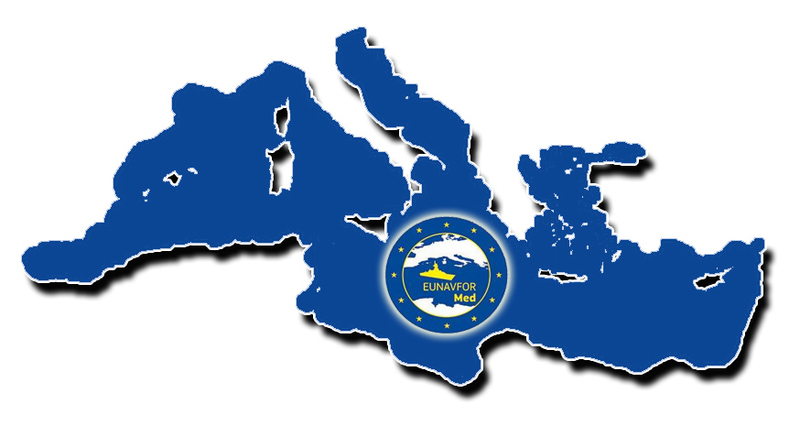 This was a very busy period, with huge challenges in meeting the routine Maritime Defence and Security Patrol (MDSO) commitments of the service while witnessing the renewal of the fleet through the replacement of the older ships with ultra-modern patrol vessels, then in 2015 it became even more challenging. 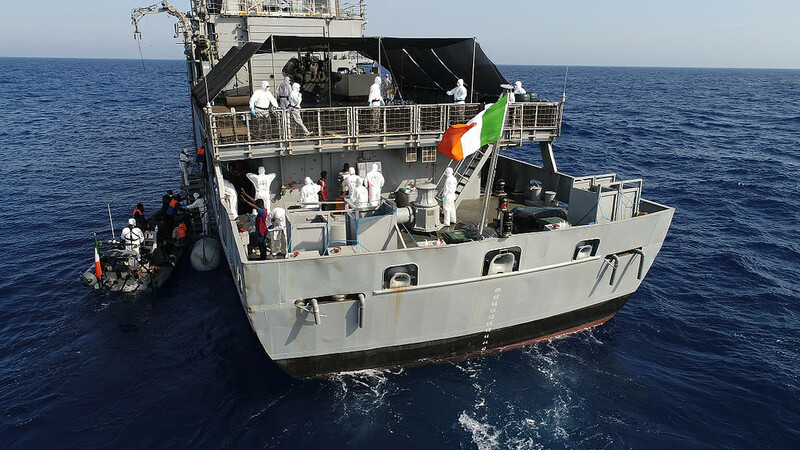 The Irish government’s response to the growing humanitarian crisis in the southern Mediterranean and to a call for assistance by its European partners lead to the first ever overseas deployment of LÉ EITHNE on ‘Operation Pontus’. I asked the Commodore about this historic deployment. Commodore Tully is not planning on settling to a quiet retirement anytime soon, he has recently become the Chairman of the Crosshaven RNLI Lifeboat Management Group and he is a board member of Sail Training Ireland which is part of the FOCNS responsibilities. He will continue to serve his community in these voluntary positions, bringing his years of experience to the roles in organisations who provide so much to seafarers throughout the country. 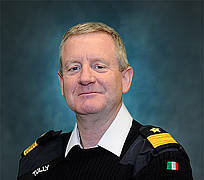 While Commodore Tully has been at the helm for many firsts, the incoming FOCNS has started his command of the service by being uniquely singular. Commodore Malone is the first Marine Engineer to hold the appointment of Flag Officer. His own career has one foot firmly in the waves with years of sea service on many ships and the other foot firmly in a dockyard. Commodore Malone is a shipbuilder, who joined the Naval Service as a young cadet on the 23rd of November 1981, training both in Curragh and in Haulbowline, like decades of cadets before and since. He trained in the Cork Regional Technical College, followed then by the Royal Naval (RN) Marine Engineering Officers (MEO) application course which was in Manadon, Plymouth. He achieved the Naval Engineering watch keeping certificate in 1987, which is the professional qualification required to take a naval vessel to sea as the Engineer in Charge, and he served for two years as the assistant MEO on LÉ EMER, swiftly followed by another two years posting on the same vessel as the MEO. Having completed these almost four years at sea, Commodore Malone rotated ashore in appointment in the Naval Dockyard and the Naval Planning office in the Shore Support Group which has grown and transformed over the decades into Naval Support Command a unit he would command in his own turn in the fullness of time. Shore time passes quickly in the service and for two more years on LÉ DEIRDRE was to be his home, when next he came ashore into the now familiar Naval Dockyard and Shore Support Group. This lead onto an appointment within Planning and Inspectorate unit, where he worked on the planning and specification for the LÉ RÓISÍN and LÉ NIAMH. He was the resident engineer for LÉ NIAMH in Appledore shipbuilders in 2000 and 2001, with LÉ NIAMH been delivered to Ireland in 2001. The then LtCdr Malone sailed on it as MEO for nearly two and a half years. He also took part ‘in what was at the time the longest overseas trips the Navy had undertaken at that time with a visit to the Far East, all the way to Japan and back’. LÉ Niamh home from the sea. With all this experience behind him, when next he came shore he was part of the team which began to develop the specifications for the P60 class patrol vessel and he undertook the Command and Staff course in 2006. In 2008 Commander Malone began to carry out the detailed specification work for the next generation of Naval vessels. It was proud day at the end of a very long journey when contracts for those vessels were signed in 2008. He remained deeply involved in that programme, which subsequently saw the proposed three vessels become four. LÉ SAMUEL BECKETT, JAMES JOYCE and WILLIAM BUTLER YEATS are all now in service and LÉ GEORGE BERNARD SHAW will arrive in July of 2018. Having been promoted to Captain (NS) during this busy period of renewal for the fleet, he is glad to be able to state that ‘As the resident engineer in Appledore, I had a very good insight into the requirements to ensure that we delivered the vessels on time, on specification and on cost’, he also explained that ‘vessels would inevitability be built but would have cost overruns…this not been the case with the vessels we have built to date’. Given that is very early days with the planning for the next class of vessels the P70 or Multi-Role Vessel (MRV), I asked the Commodore about the project. Commodore Malone assumes command of a service which is operating at the highest levels domestically and internationally, with a fleet of ships which for the first time in many years have fifty per cent that are less than four years old. With huge challenges to be faced to secure new ships which can take on the ever-increasing weather of the North Atlantic, huge challenges that will certainly arise in securing Irelands maritime border with the looming uncertainty of Brexit and the ever-present issue of securing crews to face these challenges by finding a solution to the retention of highly trained personnel. 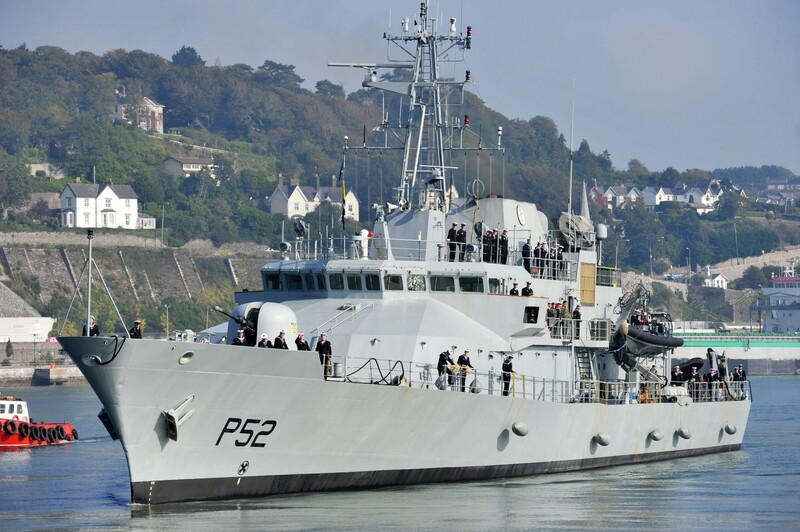 LÉ EITHNE is the Flagship of the Naval Service and is the only vessel where the Officer Commanding (OC) is a Commander; the OCs of all the other seven vessels are Lieutenant Commanders (LtCdr). The wave’s height is defined as the distance from the crest of one wave to the trough of the next. The wave period is the distance between two waves passing through a stationary point, measured in seconds.